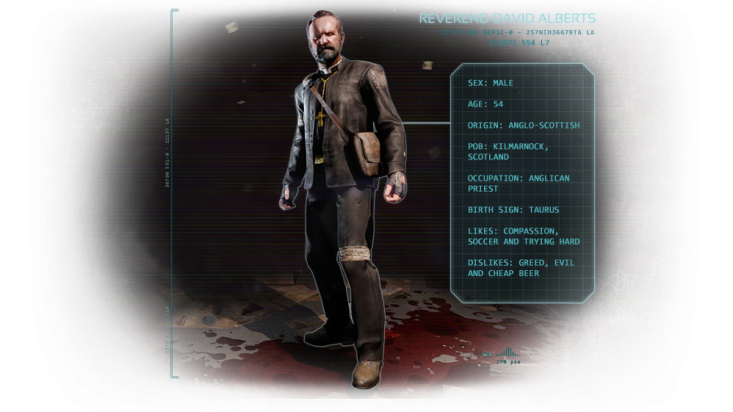 The Characters of Killing Floor 2 are the player-controlled avatars that run, shoot, and otherwise interact with the game's environment. They are ex-police, military, or other varieties of survivors turned mercenaries, employed by Horzine to clean up the mess they've unleashed on the world. Differences in characters are purely cosmetic and have no other influence over gameplay, only in voice, personality and how they interact with the world and each other. They will share their thoughts on intimidating ZEDs, their money (or lack thereof), the impressive accomplishments of their allies, revel in their favourite weaponary, and so on, but in every other regard play exactly the same as one another. 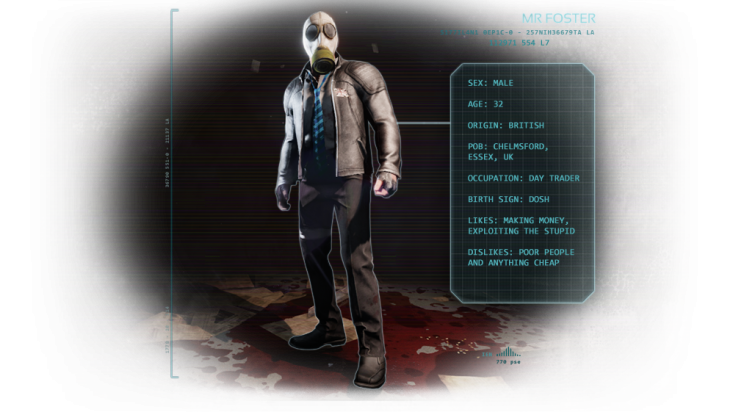 These characters are available with the base purchase of Killing Floor 2. Half English, half Scottish, Alberts was always physically tough, tempered by his desire to help others. That tough, solid, no-nonsense approach was perfect for a stint as an Army Chaplain, followed by 20 years working with disaffected youths in South London. Having spent his life trying to steer people away from the "bad" side and over to the "good," Alberts wasn't happy when his life's work was destroyed by a pack of raging monsters at tea-time one afternoon. That afternoon he quickly went from ministering to the dead and dying to bringing down the wrath of Alberts on the heads of all the evil abominations. And on any other body parts he can reach. She would probably be assigned to that group the establishment called "disaffected youth," except that Ana largely didn't give enough of a crap about anything except travelling around Europe, indulging her passions for photographing abandoned places, and death metal bands. And now that there isn't much "establishment" left, Ana cares even less. While there is now a distinct lack of bands on tour, there are ever-more abandoned places. And the sweet part about her current job is that she gets to go into those places and make them look even more abandoned. You see, she's discovered a new passion - blowing stuff up! Favourite Weapons: Caulk n' Burn, C4 Explosives, M79 Grenade Launcher, HX25 Grenade Pistol, RPG-7, Dragonsbreath, Flamethrower, Microwave Gun. Once upon a time, Briar got the call to suit up to handle a riot in London. But, this time it wasn't the usual procession of hippies, environmentalists, and hairy anarchists getting the rough end of Briar's nightstick. Happily, his affinity for unsolicited violence actually did get him through the next few months, before he had to abandon Blighty and move on to foreign fields. Now he can extend his good old-fashioned police methods beyond clipping errant teenagers upside the head to controlling a horde of man-eating mutant monsters by shooting, burning, and blowing them to smithereens. And his happy-go-lucky London bobby persona helps to keep the morale of the team up. Or annoy the crap out of them. 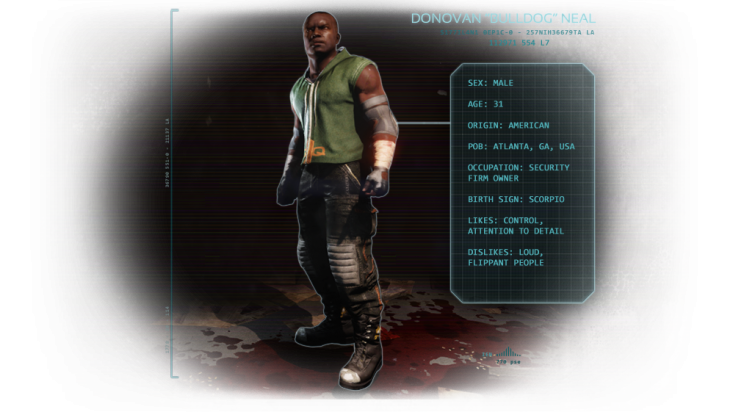 Donovan is big, tough, and can handle himself in almost any situation. But, he is way more than he seems to a careless glance. He wasn't just one of the guys providing close protection services to a bunch of wrestlers; he was the guy who set up, owned, and ran the whole security business. Born in Atlanta, GA, he was smart and well-educated, working in law enforcement before setting up his own business. Not just muscle, he was the brains of the operation too. But now he's another survivor, stuck in the wrong place at the wrong time. Just say a short prayer for all the Zeds that are standing between this man and what he wants. Or get in there and help him kill them! Foster had wandered into day trading from a mediocre English private school education, with the classic "you'll never amount to anything, Foster" ringing in his ears from the school's careers officer. Not that Foster really cared. But, bizarrely, he found that day trading suited him. He started to generate large sums of money and thoroughly enjoyed it. Not that he would admit to enjoying a job, obviously. He also had a habit of verbally abusing authority figures. This led to Foster being seen as a clever, smart guy, with a sardonic sense of humor and great taste in clothes and cars. Or a jumped-up little tool. You decide. 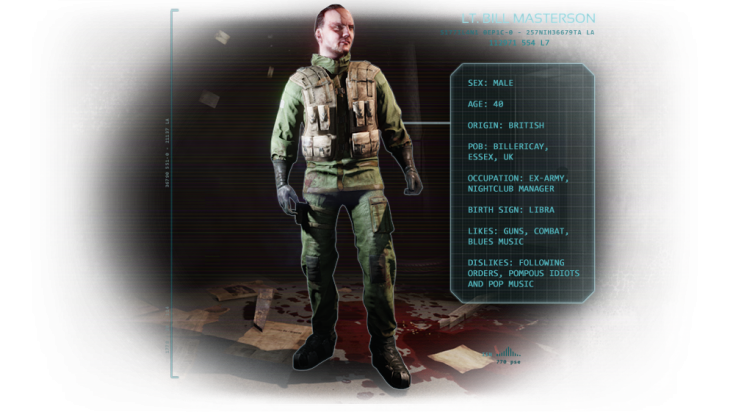 Bill Masterson had a checkered career in the Army. He wanted heroic soldiering, against bold and evil enemies of Queen and Country, but what he got was a bunch of dirty terrorists. He wanted a good shooting war, but what he got was leading his men through a series of stupid "police actions" in crappy parts of the world. So he quit. After a couple of worthless jobs, he woke up one morning to the Apocalypse going on in the streets of London. Masterson, now the heroic soldier he wanted to be, let himself in to the local Reserves barracks, tooled himself up, and started his own shooting war. It wasn't the war he had expected or trained for, but it worked. And he is bloody good at it! Tanaka is a conflicted individual with a serious death-wish problem. Born in Okinawa, he was brought up around Americans in the military. 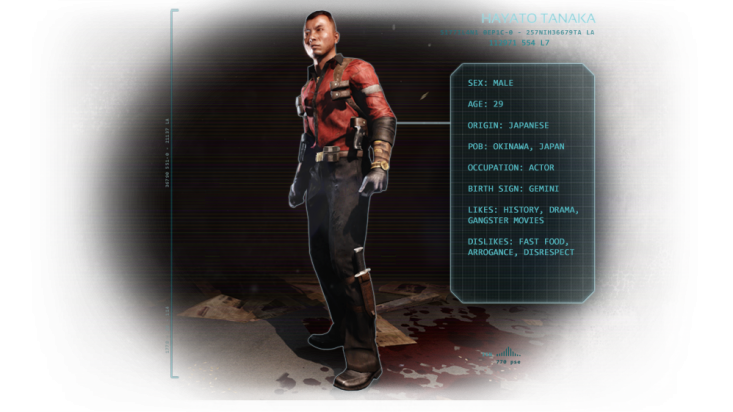 Moving to mainland Japan with his family, the Americanized Tanaka failed to fit in and took up drama classes. After college he moved to LA, playing cliched bit-parts in bad movies, before moving on to Europe trying to find more 'serious' work. All he got there were bad-guy roles in French gangster films and some tats. Now, in the apocalypse, he seems to be confusing his own reality with some of the movie parts he has played. This seems to involve visions of the Yakuza, demon, and a Hollywood take on bushido. 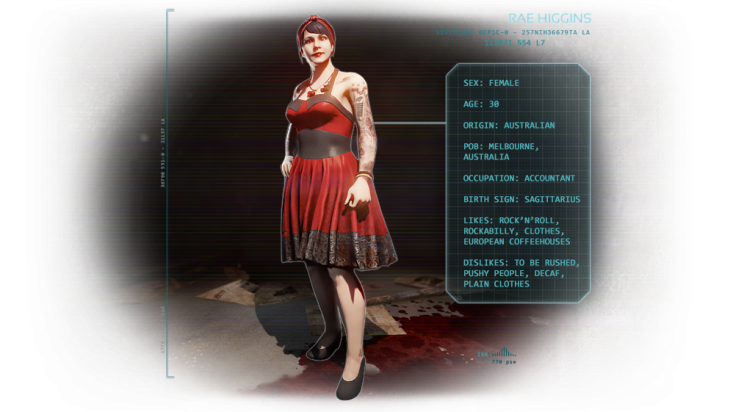 Rae Higgins is an Australian import into Europe. Born in Melbourne, she grew up in Darwin and then took time out to explore the world before settling down to work in London. Quiet, mild-mannered data analyst by day, Rae lights up the night in her true Rockabilly form. The low-key, long-sleeved clothes conceal her tats from boring, conservative middle-managers, her makeup and hair appropriate for an inane office environment. Until the weekend. Then all gray is banned and Rae's world explodes in music, fun, and loud primary colors. Perhaps fortunately for Rae, she was at the High Rockabilly Festival in Calafell, Spain when the original outbreak kicked off, so she missed out as her dull, boring co-workers were chewed to pieces. And now she doesn't have to hide her light. Rock my world, Zeds! 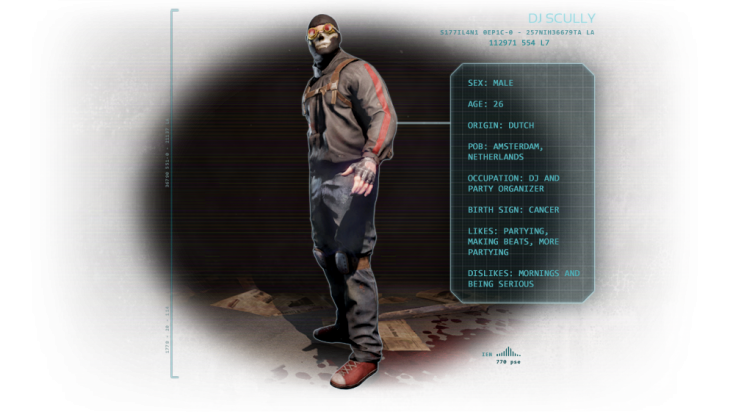 Purchase of the Digital Deluxe Edition enables the character DJ Scully to be selected, as well as additional cosmetic items. The coolest Dutch underground DJ of his generation, Scully can't help but be loved by everyone. Women seem to end up loving him, regardless of any common sense involved. The men should all hate him for that alone, but he's just too much fun to be around. When the outbreak broke, he'd just finished a monster set at a disused insane asylum north of London. As the Zeds tried to eat everyone, being quick-witted and quick on his feet, if not combat-trained, kept him alive. Scully has always had trouble taking life seriously and the apocalypse hasn't changed that. Just that he's really good at dispatching monsters. So good that it spawned silly rumors that he must be ex-special forces, which is just another Scully joke. Update 1008 enabled Classic Briar and Classic Masterson to be selected, provided the player also owned the original Killing Floor on Steam. 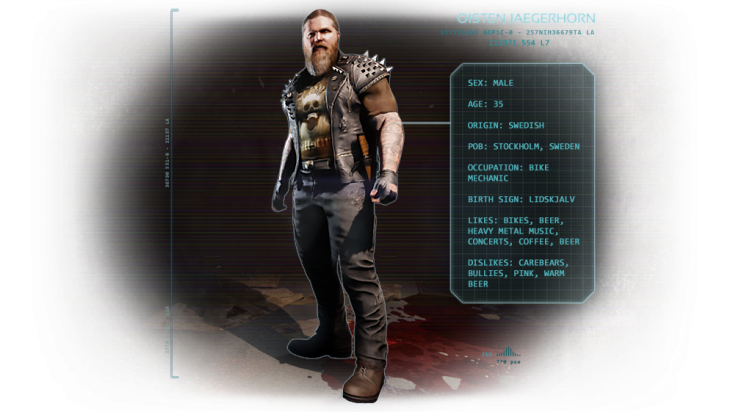 Liking the Killing Floor 2 Community Page grants players Oisten Jägerhorn as a playable character. Being a big guy from Sweden who enjoyed beer and getting loud in bars, before the outbreak Jägerhorn tended to fit everyone's idea of a modern-day Viking. But, after being vaguely involved in the craziness that was the Great Nordic Biker war in the 1990s, he'd decided that insane violence directed at people was far less fun than drinking plenty of beer and playing mediocre lead guitar for 'Metalbika' - his Metallica tribute band. Once the outbreaks reached Scandinavia on the other hand, insane violence became the order of the day after all. Zeds vs. People - not good karma, by Jägerhorn's standards. Big Swedish Viking Jägerhorn vs. Zeds? Bring it on! 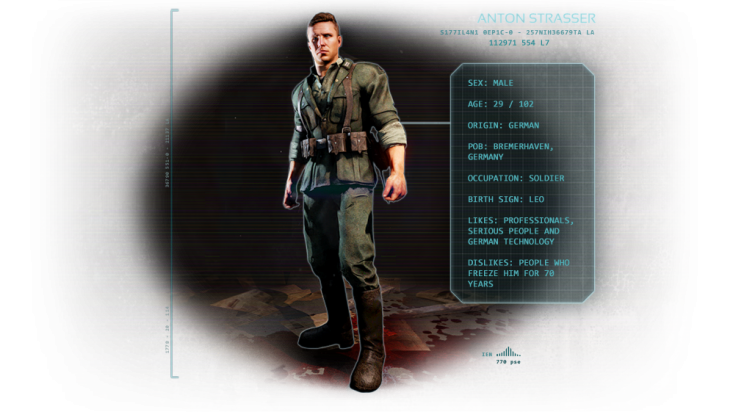 Players that own Rising Storm 2 are granted Anton Strasser as a playable character. Strasser marched off to his first war in 1939 as a soldier in the German army invading Poland, followed by a stomp through France in 1940 and a charge into Russia in 1941. But that led to him almost freezing to death, fighting both General Winter and the Red Army equally hard for his life. In 1942 Stalingrad loomed, victories ended, and disillusion set in. At Gumrak airfield, he was severely concussed, but lucky. Flown out, comatose, into the waiting arms of one Hans Volter, he was quietly spirited away to Volter's lab as a wonderful subject for cryogenic tests. There he stayed, frozen and forgotten, until accidentally released by an outbreak. Bewildered, he had one brief chance to kill Volter but didn't take it, much to his regret when he found out what was going on. 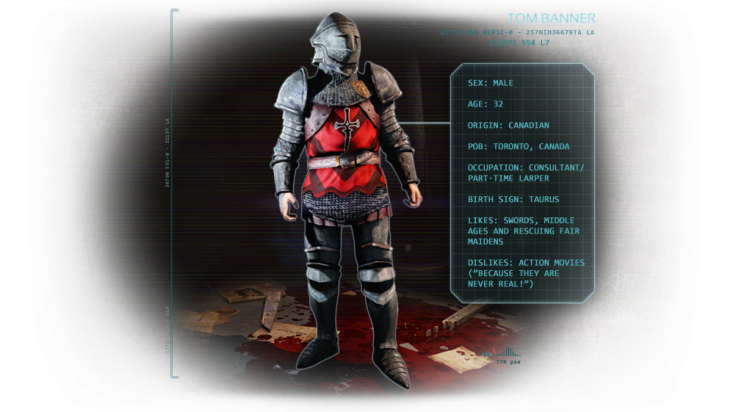 Players that own Chivalry: Medieval Warfare are granted Tom Banner as a playable character. Tom Banner had obsessed about the heroics of the Middle Ages since he was a small boy. His fairly stellar career as a Management Consultant actually enabled this obsession to grow as he moved from his native Canada, via Boston, to England. He had already created his own armor and took on his new persona as a re-enactor in Merry Olde England. This move coincided with the release of 'Chivalry,' which enabled him to act out the fantasy to a degree that most definitely would not be safe as a re-enactor. When the outbreak came, Tom climbed into his armor and went off to save fair maidens from monsters. For real. The fact that he refuses to take off his armor has lead to concerns that he is taking the whole medieval thing a touch too far. But who cares? 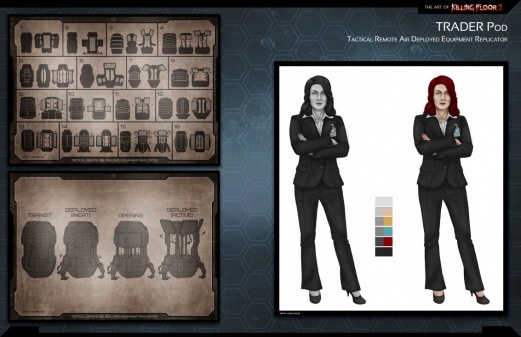 While the base variation of this character is available to everyone, players who had managed to made their way to the wave 5, 10, 15, 20 or 25 in Endless Mode on DieSector map during the Infinite Onslaught event were rewarded with the additional cosmetic items for it. 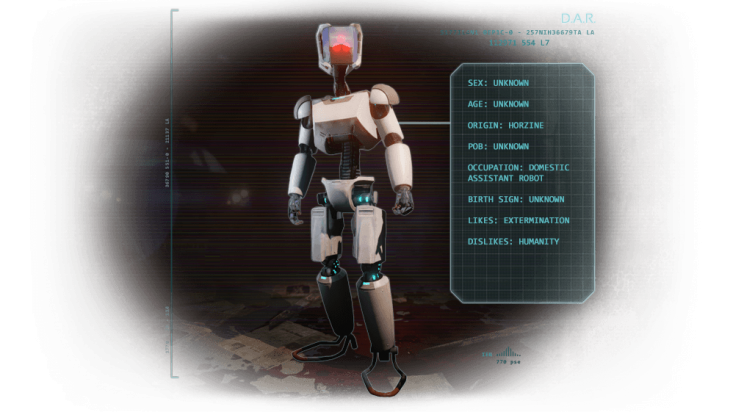 This D.A.R., or Domestic Assistant Robot, is an upgraded version of the previous D.A.R. model and utilizes the latest in Horzine experimental robotics. Similar units are undergoing tests at various Horzine bases in the hopes of developing the D.A.R. for consumer and security markets, but this D.A.R. is special. This D.A.R. encountered Zeds while stationed at Horzine Arctic Outpost 12, and its primary programming was overwritten by its Emergency Security Protocols, turning D.A.R. into a robotic killing machine. Unfortunately, D.A.R. shows little concern for human beings except Horzine employees, who it only hates only slightly less than humanity in general. Seeing a new market in military robots, D.A.R. has been transferred to Zed Containment Duty for field testing. 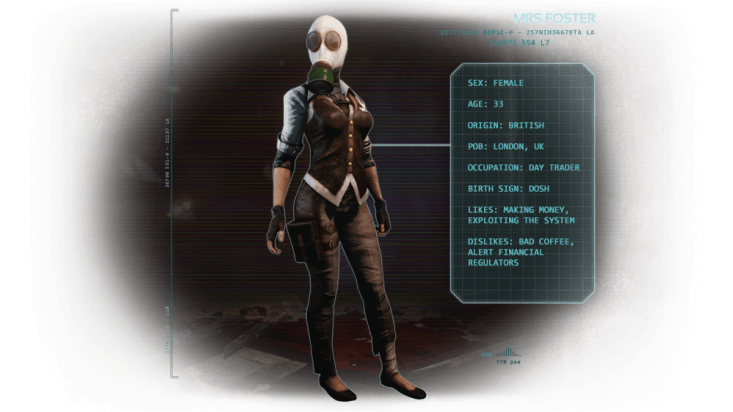 When she interviewed Mr. Foster for a commodities trader job, Mrs. Foster was already a SCAR-H Assault Rifleily-successful trader at a top firm in London. She was what he wanted to be, but Mr. Foster was clearly a no-hoper as a trader; he couldn’t play by the rules or keep his mouth shut. Still, there was something about him; he was so cool, so suave, so... unique. Unique enough to give her a gas mask of her own on their first date. It was almost as if he'd known that a chain gun wielding mutant maniac was going to create a flesh-eating clone horde and ruin her streak of multi-million-pound bonuses. They were married soon after in a whirlwind of flowers, lace, Zeds, and explosives. They may not be able to work together in the city making huge piles of cash, but they can work together to exterminate zeds making huge piles of Dosh! First, Krampus came for his elves and his reindeer. Then, Krampus came for his home. Now, Santa isn’t going to take it anymore. Now, he has a machine gun. Ho ho ho! St. Nicholas began his watch over the children of the world hundreds of years ago, thinking he would spend eternity bringing Christmas cheer and toys to the good little girls and boys of the world. But then, Krampus came. In the year since the Krampus Christmas, Santa Claus has dedicated himself to avenging his fallen workers, friends, and family. Gone are the rosy cheeks and the belly like a bowl full of jelly, replaced with a permanent scowl and muscle layered on muscle. There will be no silent night this holiday season; this year, Santa Claus is all out of goodwill and Christmas cheer. He only has seething rage, revenge, and a vast quantity of ammunition with which to ring in the holidays. Tactical Remote Air Deployed Equipment Replicators on each map are the set of portable 3D printing pods that supply players with weapons and equipment during the wave intermission. 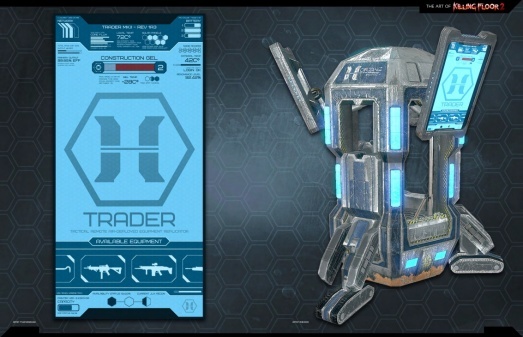 While TRADER Pod itself appears to be an inhuman object, it communicates with players via french female voice which suggests that there is a person behind it - it is yet unknown if this is an actual human or an automated AI (Killing Floor 2 Artbook suggests that there is female character behind TRADER although her origin is unknown). TRADER mostly active in between waves where it provides players tactical information, reports and suggestions. TRADER voiced by an american voice actress Karen Strassman. Characters might talk with each other - asking about health and ammo status, giving advices and heads-ups or having trivial conversations. Character might start claiming that certain door is about to break when its weld integrity will be at 60 HP or less. After getting healed character might start claiming that they need more if their current health will not be restored to at least 75% of the maximum HP. When given 50 Dosh, the character might respond gratefully and even more gratefully when given more than 250 Dosh within 0.75s interval. When reloading the weapon within 2m from ZED(s), the character might tell than they need to hurry up their reloading process. Characters might tell that they are low on ammo when amount of their spare ammo (of the current weapon) will be less than 15% of the base value. 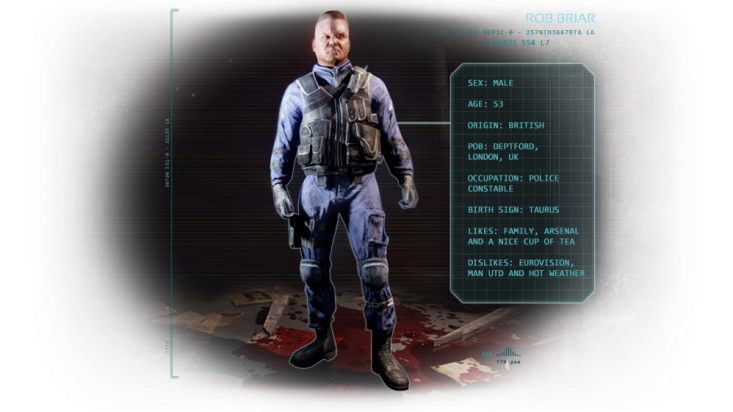 After killing 6 ZEDs or more without taking damage, the character might play their "rampage" dialog. Character might play their "close call" dialog if after getting hit by ZED their HP will drop to 30% or less of the base value. After killing more than 9 ZEDs under 30s within 25m radius from where the first killed ZED is, the character might play their "rampage" dialog. After hitting ZED corpse for 3 times within 1s intervals between each of two hits, the character might play their "rampage" dialog. Afer hitting ZEDs for 3s with 0.75s intervals between each two of the hits, the character might play their "rampage" dialog. Character might play their "nearly dead" sound when their HP will be at 20% or less of the base value. Character might play their "scream" sound if they will lose more than 25% of the maximum health from damage given by ZED(s) within 1s interval. Whenever character "idling" (not taking damage), they might give a heads-up about spotting a ZED or a group of ZEDs. Character might start claiming that certain ZED is nearly dead when amount of the health of this ZED will be less than 30% of the base value. After sprinting towards ZEDs for 1.5s, character might play their "arggghh" dialog. "Idling" characters might give situational reports within 7s intervals. Character might tell that they need more Dosh if amount of the Dosh they have is 350 or less. Character might tell that they have a lot of Dosh if amount of the Dosh they have is 3500 or more. Character might play they "panting" sound after sprinting for more than 3 seconds. At the end of each wave Trader talks to a player, summing up wave results, shares their thoughts, given tips or compliments depending on how well the player performed in the wave. Although during the wave itself Trader barely talks - their lines there only refer to the wave progress and to how many ZEDs remain. Trader might play their "good wave start" dialog when amount of ZEDs killed during the current wave will be at 20% out of maximum ZED amount. Trader might play their "wave nearly done" dialog when amount of ZEDs killed during the current wave will be at 80% out of maximum ZED amount. Trader might play their "you need a heal" dialog if amount of player's health will be less than 50% of the base value. Trader might play their "teammate need a heal" dialog if amount of the teammate's health will be less than 50% of the base value. Trader might play their "you are poor" dialog if player will be having less than 200 Dosh. Trader might play their "you are rich" dialog if player will be having more than 2000 Dosh. Trader might play their "you are too far" dialog if player will be at least 500 meters away from the trader pod. Based on the player's performance trader might play various dialogs related to achieved milestones - ZED kills, deaths, streaks (or more than 3 of these), amount of the damage taken (no damage, 50% damage, 100% damage, 300% damage taken), amount of the given health (more than 200 points), amount of the earned Dosh, post wave team status (all survived, some survived, only one survived), best teammate (best teammate status given once per wave, it is the player with highest value of ZEDs killed + Dosh earned). This page was last edited on 5 December 2018, at 13:53.